When you put together one of Greg Sargent’s Tweet Houses, you’re not only building a shelter for the birds, you’re also building fun memories. 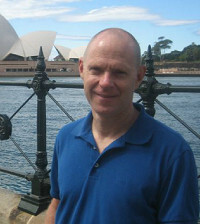 Greg is an industrial designer who worked in the auto and toy industries before coming up with the idea for Tweet Houses. His birdhouses are vibrant and colorful, with just the right mix of graphics and patterns. They’re easy to assemble, so you don’t have to worry about a fun activity turning into a frustrating one. Each kit is made from flat sheets of recycled plastic. Simply pop the pieces out of the frames, then plug the tabs into the slots. Tweet Houses are designed to be used outside, and birdwatchers estimate at least 22 different species can nest in them. But that’s not the only use for these designer dwellings. We’re perching them on mantles, using them as centerpieces, and stashing treats inside for birthday parties and Easter egg hunts. In the backyard, Tweet Houses can be transformed into luminous lanterns if you add battery-operated tea lights. Clearly, they’re not just for the birds. A little birdie told us that The Daily Grommet wanted to hang out ... we're thrilled! I'm Betsy G., here to represent all things sTweet for the day. Tweet Tweet Home is a line of items made from #5 recyclable materials. We're lil'Bud planters, Dapper Flapper pennants, and Tweet Tweet Home birdhouses, designed to be used outside, but often used inside. I'm happy to share ideas on how to use these products and hear yours, too. If you were a bird looking for affordable housing would the Tweet Tweet Home be a good place to, well, perch? Looking forward to the conversation! birdhouses are made from recycleABLE plastic, but not from recycled plastic? and made in china? so they're not green by any definition. the idea is great but in reality it's very disappointing. Hi there ... You are correct, Tweet Tweet Homes are manufactured in China. Over 15+ years, we've nutured responsible relationships with manufacturers there who meet our quality standards. Tweet Tweet Home's #5 recyclable plastic (polypropylene) is, indeed, made from material that contains recycled content. For more information on "polypropylene" here's a link to the Wiki definition: http://en.wikipedia.org/wiki/Polypropylene. We chose this material because it is manufactured in 'sheets' allowing for lots of color and design combinations. It's also considered a 'food grade' plastic meaning it has a very high 'melting point' (you'd see 'dishwasher safe' or 'microwave safe' on a food container). If you 'Google' "polypropylene" you'll see a lot more information its recycled content and its recyclability. The product is what it is ... sorry that disappoints you but we think it's a better solution than using woods or metals. We prefer to leave the trees FOR the birds. There are lots of designs/materials used in the birdhouse manufacturing arena that may work better for you. Thank you for providing the opportunity for me to talk about the material! 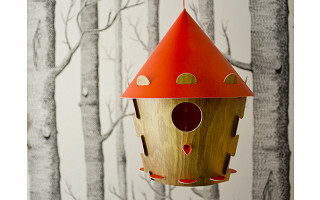 Tweet Tweet Home is made from 100% recycled material and is recyclable. The recycled plastic is from food containers, so it has been recycled as well. We know very well that our community sticks with the good values of made in the U.S.A. but unfortunately sometimes it just isn't possible. We always choose our Grommets based on providing value and we feel strong that this will make a fantastic Grommet. Sorry to learn this is another "China" product . . . I am proudly trying to support American grown and made products. Your houses are very pretty! Thanks, Trish! We continue to search for manufacturers throughout the world, actually. As we're able to make in-roads with production, we will. There's actually a wonderful birdhouse manufacturer right here in MN, but they only deal in wood/paper. Perhaps someday Tweet will be big enough that they'd consider re-tooling for us. We'd love to save on freight charges and pass the savings along! Will this keep Squirrels out? That has been a problem with us with other bird feeders. Does it come with a hook or a pole for free standing? Tweets do come with a loop for hanging .. it's about 2" long. I have two Tweets in my yard. For the one in a tree, I use a small metal extender rod/hanger ... needed that to fit around branches, actually! The other I have hanging on a plant hanger (plant on one side/Tweet on the other). I don't have issues with squirrels as it isn't a "FEEDER" so with no treats in the 'fridge' they don't seem to want to get in there to live! Plus, I think the outside is pretty darn slippery for their claws. Hope you enjoy! Thank you for commenting. Oh, I love these. And then I read they were not made in the US. I'm so, so sorry. I am trying so hard to avoid products made in China and you know how hard that can be...so when the product is a "want to have" rather than a "need to have" I have to pass. I'll keep checking the site and I hope you can find a US manufacturer. It's a beautiful and smart birdhouse! Unfortunately, I agree with Ann. I would buy it in a minute if it were made here in the USA. It is a perfect gift item, but my friends wouldn't appreciate china made products. They're very sweet-looking - a real plus for an item that's functional. But I, also, agree. I'd rather spend more and know that my money is supporting US businesses than buy something for a better price from China. So....sorry...have to pass on this Grommet, even though it's very cute and a good deal. Please see The Daily Grommet's note above regarding product selection. I'm here to answer questions you have about Tweet Tweet Home specifically. If you have comments/concerns about the product selection I think they are best directed to The Daily Grommet directly. As noted in my remarks above, Tweet Tweet Home maintains long-standing relationships with manufacturers who are able to produce this product in an efficient and cost-sensitive way. We'll continue to source from vendors who provide excellent service and value and welcome inquiries from new possibilities. From a very winter-y Minnesota, we wish you a soon-to-be-Spring! I support all that is Made in the USA! Clever design. But too bad. Betsy, thanks for all the explanations about the product and the reason why the bird houses aren't made in the USA. Do you have to disassemble the house to clean out a used nest? Thanks...I love the bright colors! Hello there Looking for spring! 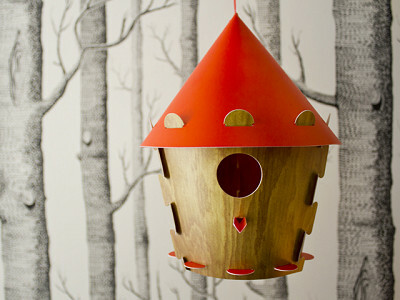 We're looking for it too and can't wait to get these beautiful birdhouses up around our office once it hits. As you saw in the video, the sun is what really makes these birdhouses shine. To answer your question, you can easily disassemble these to clean them. It's literally a pop out, pop back in process. It will probably be much easier to go that route than try to clean with old nests inside. Honestly, I'm so embarrassed by my fellow grommet commenters. All of you complaining about only supporting USA companies, do you not realize Daily Grommet is a US company and last I checked Minnesota was also in the US. Do any of you actually purchase the USA products or just complain when something isn't made here? Perhaps when US citizens are willing to work as cheaply as citizens of other countries more products will be made here. This is a great product, I'm buying! Totally agreeing with Susan. Unfortunately most people are not well informed with regard to 'buying American'. Those of you who do will find it very difficult to find a company that gets all it's rescourse from the USA. Rescourses at the moment come from China, India, Korea. There is no way around that, somehow most products in your home will come from those countries. You will not know because the USA doesn't has a law that says that where the recourses are from needs to be stated on a label. Until you call the companies and ask them a bout every part that is used in a product, you will not know. 'Made in America' does not mean produced with 100% American materials. I'll take 3 of these lovely colored homes! Thank you for bringing them to the market! When you put together one of Greg Sargent’s Tweet Houses, you’re not only building a shelter for the birds, you’re also building fun memories. Greg is an industrial designer who worked in the auto and toy industries before coming up with the idea for Tweet Houses. His birdhouses are vibrant and colorful, with just the right mix of graphics and patterns. They’re easy to assemble, so you don’t have to worry about a fun activity turning into a frustrating one. Each kit is made from flat sheets of recycled plastic. Simply pop the pieces out of the frames, then plug the tabs into the slots.